The Actron CP9680 Code Reader is one of the best gadgets on the market for Airbag, OBD II, engine and ABS scanning. The tool’s efficiency and reliability in detecting key airbag and engine functions are quite outstanding. The company itself, Actron, is a leader in the scan tools, diagnostics, and code readers industry. Thanks to these guys, you can now tap into your vehicle’s computer and access data. This is something that you couldn’t do before. The tool is essentially used to check for and clear diagnostic trouble codes that cause the check engine, ABS and Airbag lights to illuminate. It works flawlessly as a gateway to your car’s computer. Once you plug the scanner into your car, you can run a scan to get the trouble codes. After this, you’ll be able to know the reason why your airbag light, anti-lock braking system (ABS) or engine light is on and then apply the fix codes provided. Could accessing and troubleshooting your car’s computer possibly get easier? The gadget uses cutting-edge Code Connect technology that is responsible for its comprehensive database of over 26 million verified fixes. A nice multi-color LCD screen with a trilingual menu that is easy to navigate. The gadget is equipped with ABS and SRS Airbag coverage for most vehicle brands including 1996-2013 General Motors vehicles. If you have an older vehicle, don’t worry because this scanner can read On-Board Diagnostics (OBD II) from vehicles built from as early as 1994. The device is equipped with top priority fixes and troubleshooting specific to the vehicle’s model, make, year, and engine. Another key feature is that you can plot graphically the engine’s data in real-time. You can also save this live data. Its USB Port allows you to upload or download data for example saved engine data onto your laptop or personal computer. All the fixes and repairs displayed on the Actron CP9680 are verified and certified by professional auto-tech mechanics. You can, therefore, be sure that the fix you are applying to the vehicle is the right one. 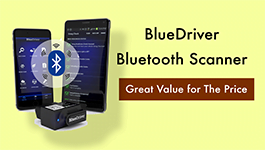 The tool is very easy and straightforward to use even without advanced OBD II knowledge. Regular firmware updates for the gadget can be downloaded from the internet. The LCD display is quite easy to read and navigate. The Actron CP9680 supports both battery and alternator charging. The device is compact enough to be held in one hand. Quick and accurate to read airbag and check engine light codes. Actron have excellent customer care services. You can look up confirmed fixes on Actron’s official website. This gadget can graph two PID’s simultaneously. 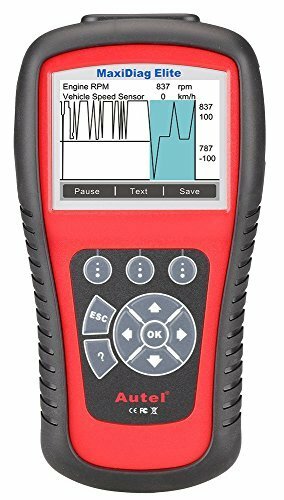 The Actron PC9680 cannot test individual sensors and lacks PCM programming. These are features that are included in other standard scanners. Therefore, one has to look for another scanner that has this function. Well, there are no other significant drawbacks worth mentioning, since it works as good as advertised. 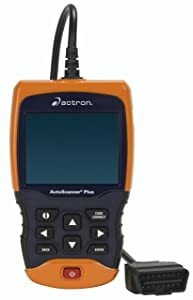 So how does the Actron CP9680 compare to other Airbag scanners at the same price range? The Foxwell Automotive Code Reader comes really close to this Actron in terms of efficiency and functionality. With the Foxwell Code Reader, you may have to pay a small additional fee online to upgrade the scanner to cover other car brands such as BMW, Toyota, Jaguar, Landrover, Ford, and others. 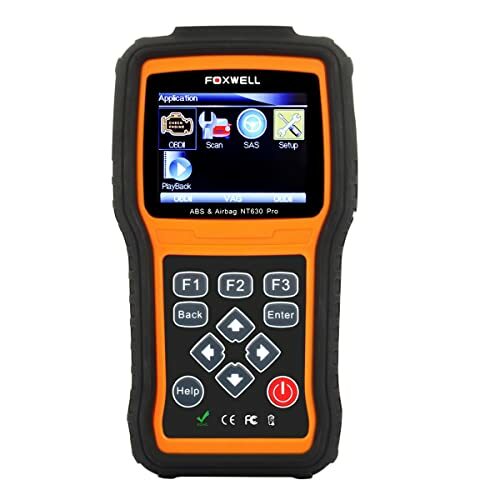 Software updates for bug fixes are also made available periodically for the Foxwell NT630. Its major advantage is that besides Airbag, SRS, ABS and engine scanning capabilities; it has a VAG diagnostic function that works on Audi, Skoda, VW, and Seat models from 1996 to 2015. 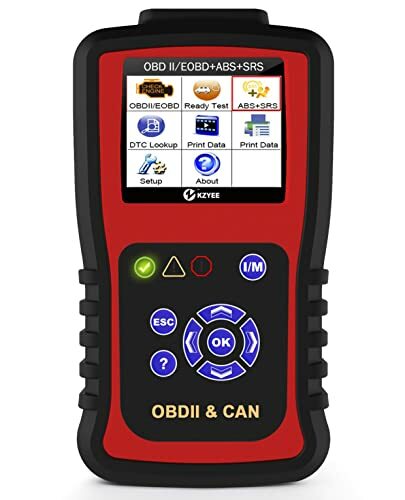 This gadget is yet another good scanning tool that you can use to check for ABS, SRS and engine trouble codes. The Kyzee KC501 Code Reader can just as well, read and solve problematic codes when there is an airbag, ABS, engine, or transmission failure. The Kyzee also allows you to save scans for later viewing. One issue is that it cannot clear all the trouble codes as well as the Actron which has over 26 million code fixes. The Autel comes with a manual that explains the very basics of the car’s computer and what the tool is all about. The Autel Maxi Diag Elite MD802 works with almost any car brand you can name. It can save data for printing and provide audible diagnostic cues. It is powerful and durable enough to be used professionally. In conclusion, Actron is dedicated to making the best readers and scanners that can quickly and accurately diagnose and fix your vehicle’s computer. The tool functions much better than its predecessor-the Actron CP9580-which had just over 3 million verified fixes. Actron CP9680 has a simple user interface hence everyone can use it including beginners, DIYers, car enthusiasts, and professional mechanics. The Code Connect troubleshooter is quite impressive. This technology is the gadget’s secret to solving code troubles. The technology itself was compiled by knowledgeable and experienced mechanics. Actron has built the CP9680 to the highest possible standards. The Actron will definitely stay ahead of its competition for many years to come. Customers who have made purchases and reviewed the device have mentioned that it works as good as advertised by the company and many of them trust its accuracy and ability to last for years. Another client also tested this gadget in 2002, 2003 and 2013 domestic vehicles and it functions perfectly in all of them. This proves that it works on a wide range of vehicles brands regardless of their manufacturing years. In a nutshell, the Actron CP9680 is a great code reader that functions flawlessly. With its Code Connect technology and comprehensive diagnostic capabilities, the Actron is definitely the go too gadget. Professional auto-technicians and mechanics highly recommend this tool. Moreover, many other OBD II scanners on the market don’t provide for updates. This makes their data obsolete after some years, rendering the gadgets useless as technology advances. The fact that the fixes for the Actron CP9680 are regularly checked by certified auto-technicians makes it the sole front-runner. You’re a fan of FOXWELL or just want to get an OBD2 scanner for yourself? Well, FOXWELL NT301 will be the best choice for you!